In the WSJ’s eye-catching Oct 9th headliner they presented several different stories all told as the same big disaster novel; planting trees as a financial investment doesn’t work. But when you look closely, there is more to the story. Let’s do that. The farm owner who diversified his inherited family farm 30 years ago by planting loblolly pine seedlings. The opportunistic real estate investor planning to recoup the cost of his residential investment by selling the pine trees on them prior to development. One of the nation’s largest pension funds, with a $2 billion investment in Southern timberland as part of their multi-billion dollar investment portfolio, managing their return. The utilitarian timber companies (“PotlatchDeltic Corp”, “GP”, “Canfor”, etc.) who purchase timber on the open market as the raw resource for their commodity products of pulp, paper and timber. The misguided benevolent US government who out of concern for poor crop prices and potential soil erosion started paying farmers back in the 1950’s to plant trees through the Soil Bank and Conservation Reserve Program. In 2007-2008 US housing market crash resulted in deep declines in pine sawtimber stumpage prices. Just didn’t need the wood because of the loss of demand. Now the subsequent recovery of US lumber production in 2017 has brought lumber demand back to pre-crash levels. For decades the southern forest has benefited from ongoing improvements in timber yields through genetics and silvicultural practices. Also the pine beetle kill in the northwest motivated Canadian sawmill companies to relocate to the south and slowly shifted demand. Drop in returns since 2000. END OF STORY – OR IS IT? Are the returns of a 40 acre one-age/multi-use investment, i.e. timber and recreation, comparable to a 5-10 thousand acre multi-age/multi-product timber portfolio? Should the annual CRP payments be included in the return calculation? Can you ignore the unfortunate timing of the institutional investors; entering the timberland market at the top of the market after a two decade runs up? What about their optimistic view of stumpage prices at the time of acquisition? How realistic was that? Are all timberland transactions the same? What about leases, timber supply agreements, higher & best use (HBU) sales, etc.? Are they pluses or minuses? What about the cost side of the equation? The cost of growing trees has had little, to no, cost increase in the last twenty years. How does figure in the return calculations? You can see what a complicated cost/benefit or internal rate of return comparison we would have to construct to really understand if trees “don’t work” financially as suggested by the WSJ story. Recalibration of timberland return expectations – When will valuations and appraisals start reflecting realistic financial returns? Future Housing trends – Will the decline of household formations stabilize? Will construction become more affordable or will interest rates continue to creep up? Available labor supply – While there seems to be adequate wood, are there adequate skilled sawmill operators, loggers or truck drivers? International Trade and Tariffs – Is the current tariff situation a temporary or long term issue for wood exports? Will there be expansion of wood use, both in residential and commercial buildings through innovations such as CLT panels, green construction, tall timber buildings, etc. Will there be future catastrophic events such as hurricanes, wildfire, beetle outbreaks, etc. that dramatically change the regional or local wood supply situation. Will we have other players (conservation easements, preserves, etc.) who create unforeseen consequences such as the CRP program did and perhaps restrict supply rather than increase? Will pulpwood demand continue to be as strong in the next 10 years as it has been in the last 10, helping keep alive many timberland investments. It really matters where you enter the story. The mature sawtimber trees in the ground today only have a few options; be harvested at current low prices or continue growing until they are too big to be utilized or die. Either way they eventually leave the supply. Then, the next generation of available sawtimber trees, now about 10-20 years old, joins the story. Their fate will depend on the discussion above. 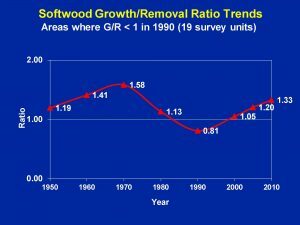 However, it is pretty clear unless there is a completely new plot line of declining lumber demand, the following age class, 0-10 year old trees, stand a good chance of telling a totally different story. We just haven’t been cutting as many trees, so we haven’t been planting new ones so there are fewer acres in the ground of the younger age timber. The supply story for the next 30 years is somewhat already determined. Remember our CRP plantations in the WSJ article? When they were planted in ‘80’s folks were actually worried about timber supply. Why? Because the G/R ratios that had been @1.5, had now dropped to 1.0. Oh dear! Well guess what? By 2000, it has corrected itself and then by 2010, the CRP plantations really started helping the growth side of the equation. Like timing, location really matters as well. Below is a map LM produced back in March of the current sawtimber expansion happening in the South. Why are these mills expanding? The Canadian mills are searching for long term available supply due to the beetle kill in British Columbia. There are a few new players taking advantage of this supply like Biewer Lumber and Twin Rivers as did Klausner awhile back. Additionally some of the more established mills like Rex, Westervelt and GP are building on their long term stability and success. Since this map was produced, Interfor has also announced a new sawmill in the Central South (Location TBD) and more expansions in their Georgia mills. 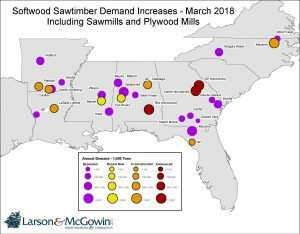 Also, not included on this map, are numerous CLT plants that could change the demand forecast including International Beams in Dothan, AL, Texas CLT in Magnolia, AR and Sterling Lumber in Lufkin, TX. But why these locations? Some because there was either already existing or idle mills to take advantage of; others because proximity of distribution centers or export markets. And a few because of pricing. In the map below, each mill concentration is associated with the 2017 Timber Mart South annual pine sawtimber price per ton for the region, as well as, an estimate of the current average sawtimber growth/removal ratio. All appear to have more than enough supply but Arkansas stands out with the tightest ratio and Mississippi with the largest. Interestingly these two areas also have the lowest stumpage prices. So Arkansas might see some improvement in pricing, while Mississippi not so much. While south GA/FL has a winning combo; one of the largest G/R ratio and the highest stumpage prices, the recent devastation of Hurricane Michael might dramatically change that. The Alabama and Central Georgia markets seem to represent winners for both consumers and producers of wood. Good prices and strong markets and stable supply. Hopefully you can see there are many underlying factors that influence the supply and demand, and ultimately timber prices. In the end, timing and location matter.